Materiality and strategy are inextricably linked. Bernd Högemann, Head of Corporate Planning & Strategy, and Joachim Krüger, Head of Corporate Sustainability & Regulatory Affairs, explore how this interaction is at the very core of long-term value creation. Clariant is committed to creating value for all stakeholders: customers, employees, shareholders, and the environment. What does that mean? Bernd Högemann: From a purely financial viewpoint, value creation equals maximizing economic profit and, if distributed to shareholders, Total Return to Shareholders. However, a purely financial perspective can lead to short-termism and jeopardize the longevity of the company. At Clariant, we look at multiple stakeholders to achieve long term and sustainable value creation: To serve our customers’ needs, to build on a highly qualified and engaged workforce, just to name two core stakeholder groups, are core levers to deliver long term value creation. We are convinced that long-term stakeholder and shareholder interests are significantly intertwined and that we create above-average value for our shareholders by considering the needs of all our stakeholders. Joachim Krüger: In other words, we look at the triple bottom line: Performance, People, Planet. If we do not take into account the needs of the people and the planet, we will not perform well financially. And vice versa: If we do not perform well financially, we neither benefit the people nor the planet. That is why we focus not only on financial sustainability, but also on product sustainability and the sustainability of our operations. Thereby, we benefit shareholders, customers, employees, and society at large. How does that materialize in day-to-day business? 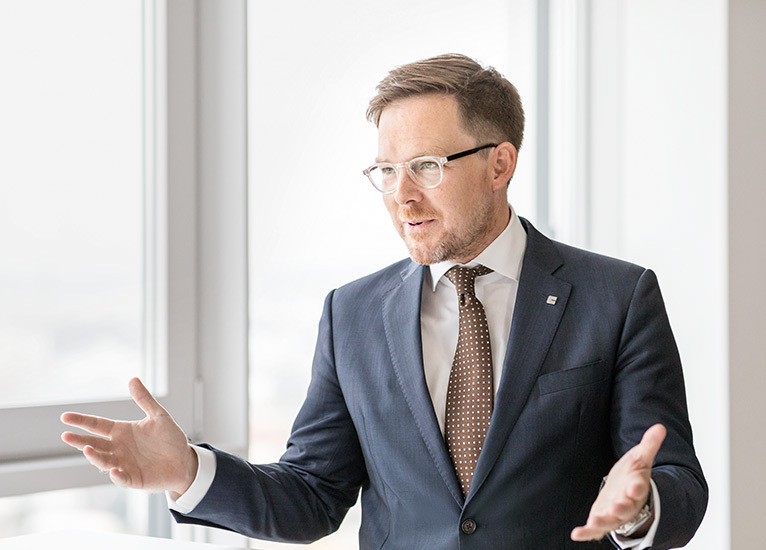 Bernd Högemann: If we look at innovation, for example, a long-term perspective is crucial for maintaining or even enhancing our ability to create value in the future. In our industry, investments in research and development typically have a payback horizon of potentially several years. Making these investments and holding on to promising innovation projects – even if they do not generate profits in the short term – is key for Clariant to remain in business over the long run. Joachim Krüger: The same holds true for investments in our employees. Developing talents and fostering an attractive work environment does not yield immediate financial returns, but it is essential for our future success. The more we focus on both financial and non-financial targets supporting our growth strategy, the better our overall performance will be. You pointed out that taking the interests and needs of different stakeholders into consideration is decisive for long-term value creation. What role does the materiality assessment Clariant conducted in 2017 play in this regard? Joachim Krüger: We have asked both external and internal stakeholders which topics they deem most relevant for Clariant to create value. By considering the views of more than 200 customers, investors, NGOs, regulators, employees, and senior managers we have gained valuable insights that help us identify strategic opportunities. On the one hand, the assessment confirmed that we are doing the right things; on the other hand, new topics have come into the picture. For example, we were happy to see that »Product Stewardship and Sustainable Chemistry« is still very high on the agenda of our stakeholders. What surprised us was that »Bio-based Economy« ranks comparatively low. However, only at first sight. Because when looking at our product range, bio-based chemistry is highly relevant for some of our businesses, but not for all of them in the same way. Overall, we consider the materiality assessment a success. The good response rate of 52% shows that our stakeholders were willing to make the effort and share their view. We really appreciate that. Bernd Högemann: The materiality assessment sets the guardrails for strategy development. We take the insights from the assessment as a core input to our new Strategic Management Process Cycle 2018 – 2021. A strategy that does not consider the results of such a comprehensive assessment is doomed to failure. Disregarding »Talent Attraction and Development«, for example, is just not an option. Keeping sight of other material topics, such as »Bio-based Economy«, is crucial for successfully creating value in the future. Speaking of strategy, how can Clariant thrive in the increasingly challenging business environment of the specialty chemicals industry? Bernd Högemann: Clariant has a robust business model and a particularly strong growth profile: Our chemistry goes into the value chains of end-consumer markets that are growing alongside global GDP – some markets even significantly above global GDP. The key to outperforming competition is to differentiate ourselves with our products. And here, sustainability comes in. Meeting the increasing demand for sustainable solutions with innovative products is the starting point to higher growth and higher financial results. This is why we emphasize innovation and sustainability as two strategic pillars out of five – and even more so going forward. 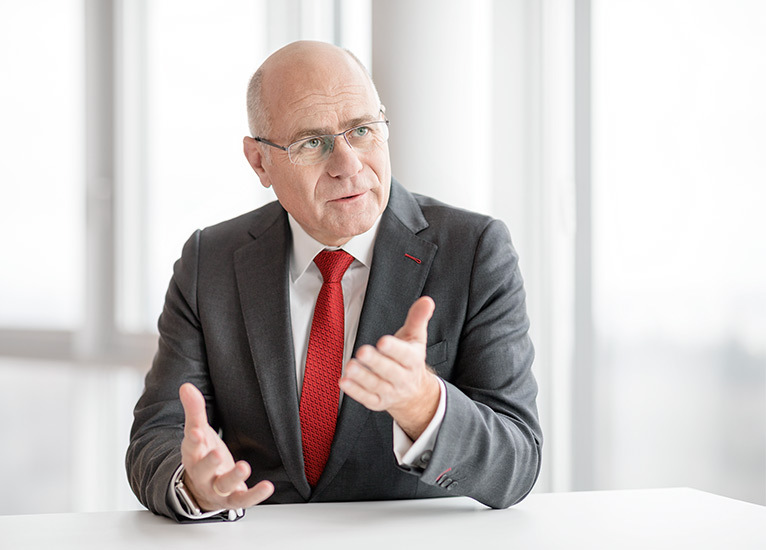 Joachim Krüger: As Bernd Högemann just outlined, in order to succeed, Clariant needs to be extremely innovative – and sustainability fuels innovation. Customers and society at large request that we offer products that are carefully formulated and also enable society to fix problems. These expectations are reflected in the United Nations Sustainable Development Goals. Clariant is well equipped to deliver on these expectations. We offer a broad range of products that enable our customers to develop solutions – especially when it comes to climate change and raw materials. Substituting less sustainable alternatives on the market with our innovative and sustainable products allows us to gain market share. Differentiating with innovation and sustainability seems to be a bold undertaking when almost every chemical company claims to be sustainable. What sets Clariant apart? Joachim Krüger: We deliver the proof points. For example, we screen our innovation pipeline and our product portfolio based on 36 sustainability criteria. Products that show an excellent sustainability profile are labeled EcoTain®. Our efforts are very well received by the markets, as the outstanding growth rates of our EcoTain® products show. Bernd Högemann: Substantiated claims are key when it comes to selling our products and services – only then we can convince our customers. And that is the real driver of sustainable, above-market, profitable growth.